Total curtain track length: Required Choose Options 151" 152" 153" 154" 155" 156" 157" 158" 159" 160" 161" 162" 163" 164" 165" 166" 167" 168" 169" 170"
Drape length: Required Choose Options 24" 25" 26" 27" 28" 29" 30" 31" 32" 33" 34" 35" 36" 37" 38" 39" 40" 41" 42" 43" 44" 45" 46" 47" 48"
Custom RV Windshield Drapes, 151" to 170" total track length. Size Note: If this is Not your size, you can easily find Your Right Size Custom RV Windshield Drapes by seeing them all in our handy chart. Custom Motorhome Windshield Drapes are drapes for your RV front driver's windshield. They are pleated and made in pairs (2 panels), but can be ordered as a single panel, three panels, or with stepped lengths for an additional charge. All custom RV windshield drapes come with one set of tie backs that secure with Velcro, so they can be easily kept out of the way when not in use. When measuring for RV windshield drapes, measure each track from side to side for the width, and from the top of the track down to where the curtain should fall for drape length. We always add an extra 6" to the width of each panel to allow for fullness, so you can be sure your custom RV windshield drapes will hang nicely and fully cover your windshield. The supple, rich sheen projects an eye-catching affordable elegance. Terra based neutrals and a novel bank of colors, highlight this innovative faux silk. Passes MVSS-302 fire retardant test. From left to right, colors are: Stucco, Cork, Lentil, Flagstone, Legend and Lodge. Please note colors may display differently on your monitor. 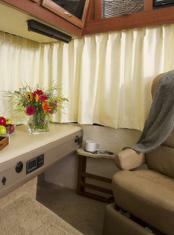 These custom-made drapes are made to your exact measurements, presenting an elegant feel to your RV. A separate lining provides superior privacy, light control and insulation. These drapes come in 2 panels with matching tiebacks and a Velcro closure at the center. Choose from 1 of 6 tasteful colors. Click here to view and/or print the Custom RV Windshield Drapes Measuring Worksheet. 1. Track Width: Measure the driver and passenger sides separately, providing the amount of track that each drape panel will cover when closed. Coach Coordinates will add extra material for proper drape fullness. 2. Drape Length: Measure from the top of the track down to where the curtain should fall for drape length. 3. Choose from 6 tasteful colors. Fabric is polyester. Lining is polyester/cotton. Dry cleaning is recommended. 4. Drapes will hang on your existing track. 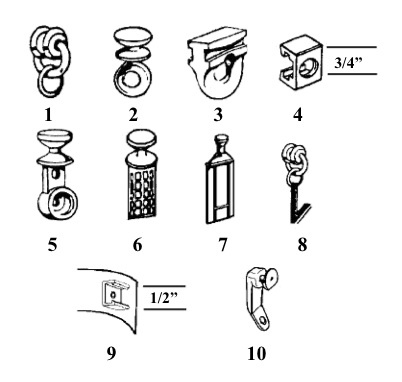 Click here to see the details of curtain carriers to select the carrier that shows how your drapes attach to your track. 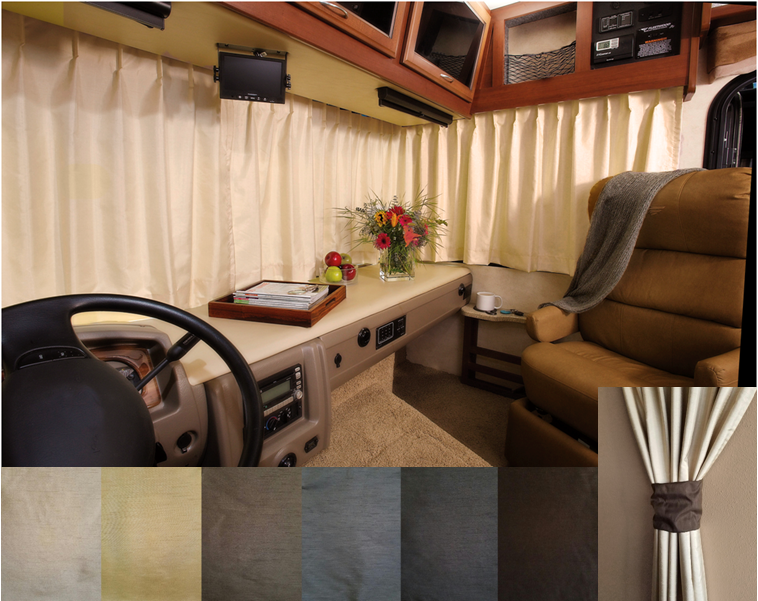 We highly recommend that you request fabric samples so that you can view the available colors in your RV environment. Different lighting conditions and other finishes will help you to confidently make the right color decision. We will mail all 6 colors to you, for free, as soon as you submit your order for Custom RV Windshield Drapes Fabric Samples. **Please note--these Custom Made drapes are made to order and ship directly from the manufacturer (California) and we are currently experiencing about a 2to 3 week processing period from date-of-order to date-shipped. Click here to view the RVSW Terms for Special Orders. I am disappointed in the pleats at the bottom of the drapes. The tops fold nicely but the pleats are the bottom of the drapes do not "hold".